At Arthur Murray Dance Studio we work around your schedule. All of our regular programs are a proven three way system that will include private dance lessons, as well as group classes, and practice sessions. We have a couple of short term, inexpensive options for you to try us out with no further obligation! We are open from 1pm till 10pm and you can book an appointment at any time convenient that is for you! To book your first sample program click here. 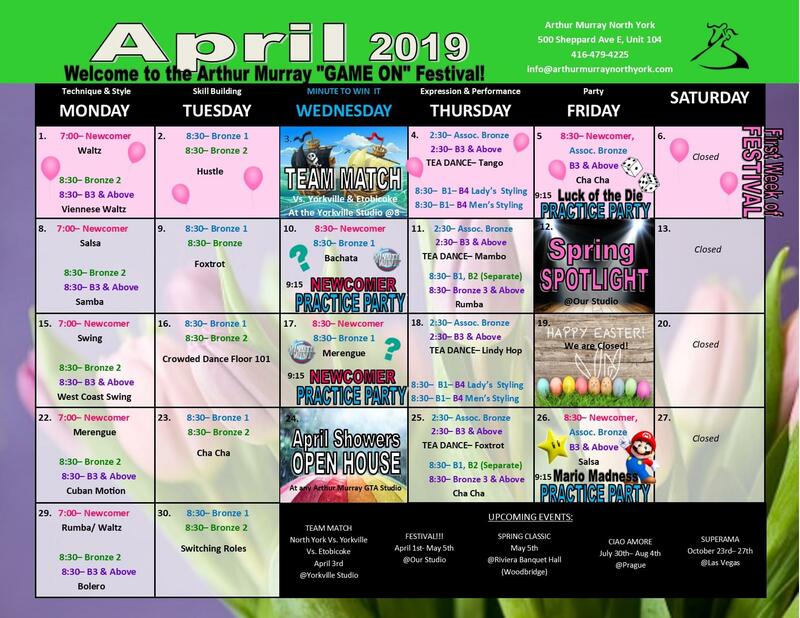 The group calendar you see below is for Arthur Murray students already on a regular program. As a new student on our sample program or our introductory program, the classes that could apply to you would be the Newcomer groups on Mondays, Tuesdays, and Fridays. We have a lot of options to accommodate your busy schedule. If you have any questions, please do not hesitate to contact us or learn more about our methods.